For other uses, see Starlight (disambiguation). Observation and measurement of starlight through telescopes is the basis for many fields of astronomy, including photometry and stellar spectroscopy. Hipparchus did not have a telescope or any instrument that could measure apparent brightness accurately, so he simply made estimates with his eyes. He sorted the stars into six brightness categories, which he called magnitudes. He referred to the brightest stars in his catalog as first-magnitudes stars, which were the brightest stars and those so faint he could barely see them were sixth-magnitude stars. Starlight is also a notable part of personal experience and human culture, impacting a diverse range of pursuits including poetry, astronomy, and military strategy. The United States Army spent millions of dollars in the 1950s and onward to develop a starlight scope, that could amplify starlight, moonlight filtered by clouds, and the fluorescence of rotting vegetation about 50,000 times to allow a person to see in the night. In contrast to previously developed active infrared system such as sniperscope, it was a passive device and did not require additional light emission to see. The average color of starlight in the observable universe is a shade of yellowish-white that has been given the name Cosmic Latte. Starlight spectroscopy, examination of the stellar spectra, was pioneered by Joseph Fraunhofer in 1814. Starlight can be understood to be composed of three main spectra types, continuous spectrum, emission spectrum, and absorption spectrum. One of the oldest stars yet identified (oldest not most distant in this case) was identified in 2014, the star SMSS J031300.362670839.3 was determined to be 6000 light years away but date to 13.8 billion years ago. The starlight shining on Earth would include this star. Night photography includes photographing subjects that are lit primarily by starlight. 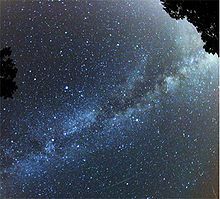 Directly taking images of night sky is also a part of astrophotography. Like other photography, it can be used for the pursuit of science and/or leisure. Subjects include nocturnal animals. In many cases starlight photography may also overlap with a need to understand the impact of moonlight. Startlight intensity has been observed to be a function of its polarization. Starlight becomes partially linearly polarized by scattering from elongated interstellar dust grains whose long axes tend to be oriented perpendicular to the galactic magnetic field. According to the Davis–Greenstein mechanism, the grains spin rapidly with their rotation axis along the magnetic field. Light polarized along the direction of the magnetic field perpendicular to the line of sight is transmitted, while light polarized in the plane defined by the rotating grain is blocked. Thus the polarization direction can be used to map the galactic magnetic field. The degree of polarization is on the order of 1.5% for stars at 1,000 parsecs' distance. , in the R filter. Martin showed that the interstellar medium can convert LP light to CP by scattering from partially aligned interstellar grains having a complex index of refraction. This effect was observed for light from the Crab Nebula by Martin, Illing and Angel. in the long-period variable M star VY Canis Majoris in the H band, ascribing the CP to multiple scattering in circumstellar envelopes. Chrysostomou et al. found CP with q of up to 0.17 in the Orion OMC-1 star-forming region, and explained it by reflection of starlight from aligned oblate grains in the dusty nebula. , which is higher than for ordinary stars, presumably because of multiple scattering from dust grains. ^ a b Macpherson, Hector (1911). The romance of modern astronomy. p. 191. ^ a b Astronomy. https://d3bxy9euw4e147.cloudfront.net/oscms-prodcms/media/documents/Astronomy-Draft-20160817.pdf: Rice University. 2016. p. 761. ISBN 1938168283- via Open Stax. ^ a b "Ancient Star May Be Oldest in Known Universe". ^ Rowell, Tony (2 April 2018). "Sierra Starlight: The Astrophotography of Tony Rowell". Heyday – via Google Books. ^ a b c Ray, Sidney (23 October 2015). "Scientific Photography and Applied Imaging". CRC Press – via Google Books. ^ Ray, Sidney (2015-10-23). Scientific Photography and Applied Imaging. CRC Press. ISBN 9781136094385. ^ a b Fosalba, Pablo; Lazarian, Alex; Prunet, Simon; Tauber, Jan A. (2002). "Statistical Properties of Galactic Starlight Polarization". Astrophysical Journal. 564 (2): 762–772. arXiv:astro-ph/0105023. Bibcode:2002ApJ...564..762F. doi:10.1086/324297. ^ Serkowski, K.; Mathewson and Ford (1975). "Wavelength dependence of interstellar polarization and ratio of total to selective extinction". Astrophysical Journal. 196: 261. Bibcode:1975ApJ...196..261S. doi:10.1086/153410. ^ Kemp, J. C.; et al. (1987). "The optical polarization of the Sun measured at a sensitivity of parts in ten million". Nature. 326 (6110): 270–273. Bibcode:1987Natur.326..270K. doi:10.1038/326270a0. ^ Kemp, James C.; Wolstencroft (1972). "Interstellar Circular Polarization: Data for Six Stars and the Wavelength Dependence". Astrophysical Journal. 176: L115. Bibcode:1972ApJ...176L.115K. doi:10.1086/181036. ^ a b Martin (1972). "Interstellar circular polarization". MNRAS. 159 (2): 179–190. Bibcode:1972MNRAS.159..179M. doi:10.1093/mnras/159.2.179. ^ Martin, P.G. ; Illing, R.; Angel, J. R. P. (1972). "Discovery of interstellar circular polarization in the direction of the Crab nebula". MNRAS. 159 (2): 191–201. Bibcode:1972MNRAS.159..191M. doi:10.1093/mnras/159.2.191. ^ Bastein, Pierre; Robert and Nadeau (1989). "Circular polarization in T Tauri stars. II - New observations and evidence for multiple scattering". Astrophysical Journal. 339: 1089. Bibcode:1989ApJ...339.1089B. doi:10.1086/167363. ^ Serkowski, K. (1973). "Infrared Circular Polarization of NML Cygni and VY Canis Majoris". Astrophysical Journal. 179: L101. Bibcode:1973ApJ...179L.101S. doi:10.1086/181126. ^ Chrysostomou, Antonio; et al. (2000). "Polarimetry of young stellar objects - III. Circular polarimetry of OMC-1". MNRAS. 312 (1): 103–115. Bibcode:2000MNRAS.312..103C. CiteSeerX 10.1.1.46.3044. doi:10.1046/j.1365-8711.2000.03126.x. ^ Wolstencroft, Ramon D.; Kemp (1972). "Circular Polarization of the Nightsky Radiation". Astrophysical Journal. 177: L137. Bibcode:1972ApJ...177L.137W. doi:10.1086/181068.